Beautifully furnished, remodeled and winterized with central heat, as well as a fully equipped kitchen. This home sits directly at the waterfront (There are no houses in front of us.) with magnificent views from the house and wrap-around porch. Enjoy relaxing to the view and sound of the ocean with the surf crashing onto the rocks below you. There are 8 window boxes and a flower garden and four beaches only 1/2 mile away (15-20 minute walk). Enjoy fishing right in front of the house or treat yourself to a glass of wine watching the moon rise above the Atlantic Ocean. Come and view coastal Maine in a fully restored, custom designed and decorated Victorian New England home. Parking included for up to two cars. There is No bathroom located on the third floor, but there is a sink. Table seats 8 or more. There is also dining available on the porch. Short drive to golf course. This was our first time vacationing in York, ME, and The Ocean Rose worked our perfectly. It is within reasonable walking distance to the Nubble Lighthouse, Short Sands Beach, shops, restaurants, bowling/arcade and ice cream... Long Sands is easily visited as well. Communicative owners and a very helpful property manager too! The Ocean Rose is a vintage victorian home sitting right on the water with fantastic views. It is furnished with gorgeous antiques and very well equipped with whatever you need. The porch wraps completely around the house and a section of the back is screened in. It is conveniently located to restaurants and shops. The 6 adults in our party had a very enjoyable week. Beautiful property right on the ocean! The Ocean Rose is located right on the ocean and has a beautiful view. The home is well maintained and the accommodations are very nice. 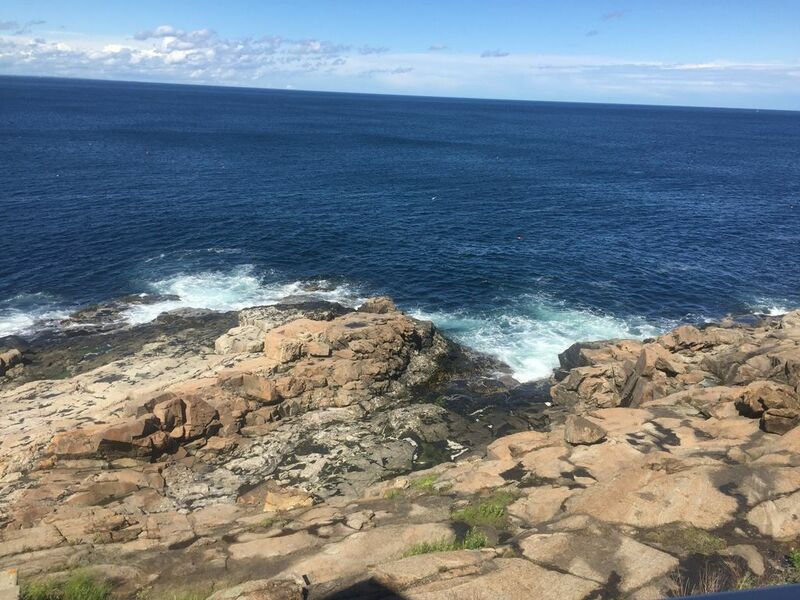 We loved exploring the ocean rocks and tide pools, fishing, and walking to Nubble Light House and Dunne's Ice Cream. I love staying in this wonderful home with the stunning ocean views from every window. This year will be my third time to visit! This was the eighth year that my husband and I, our four kids, and my parents stayed at the Ocean Rose. The home is absolutely gorgeous, very charming with its older-home details and yet very modern with a modern kitchen & appliances, modern bathrooms, etc.. A favorite spot is the screened porch, where we eat all our meals overlooking the ocean. It is fun for the kids to climb around down on the rocks too. There is plenty of room for our family in this home and the kids adore the attic bedrooms (three twin beds total in two adjacent rooms), where you can lie under the eaves & hear the ocean waves. The bedding is excellent, very soft sheets & excellent pillows, always important! I can't say enough about the house, which is obvious since we're on year eight. There is not much yard to play in, however, when in York Beach there is so much to do that it has not been a problem for us. The only fault of the home is that it is walking distance to Brown's Ice Cream. This has not helped anyone's waistline! :) Highly recommend this home. A 10-minute walk to Nubble Lighthouse - the most famous and photographed lighthouse on the coast of Maine. Sunbathing, kayaking, hiking, horse rides, pleasant, scenic walks on the Cliff Walk and Harbor Walk, strolls on Short Sands boardwalk, shopping in art galleries, boutiques, and the Kittery Outlet. The York Recreation Center offers a variety of activities, and York Wild Animal Kingdom for the children. Excellent restaurants are within a 10-minute walk on the Nubble, and in the historic villages of York, Ogunquit and Kennebunkport. Take in the Ogunquit Playhouse and tour the antique stores up and down Route 1. The Fall season delights you with Harborfest, Ghostly Tours, mid-October, pumpkin farms, and beautiful drives along the coast. $3850/week minimum for 2 guests; Additional Guests $27.50 per day Maximum Occupancy: 8 people including children Minimum 7 days rental; Saturday to Saturday Rates are discounted prior to June 1 and after September 30. Note: Until confirmed, rates are subject to change without notice. Contact Property Manager at 405.691.3561 to book reservation without service fees.